The Active System is a performance timing solution for demanding events such as Road Cycling, Triathlon, Watersports and Motor Racing. 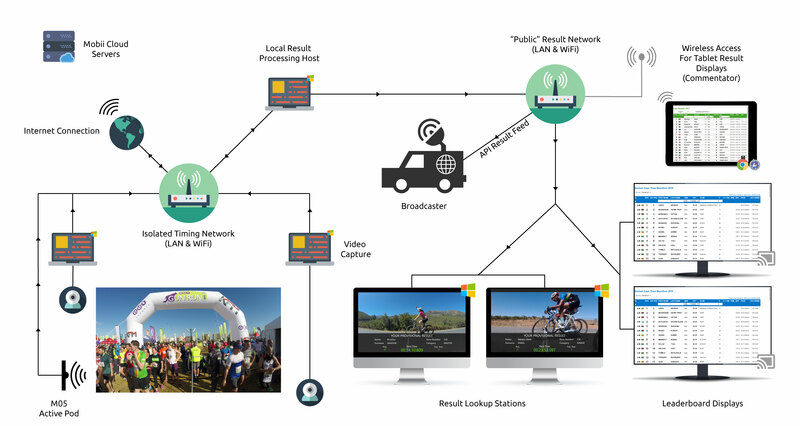 The Mobii 2.4 GHz Active Timing System represents an evolution in sports timing technology and overcomes several technical challenges faced by existing systems in the market. The Active Pod is designed with an ultra-small form factor making it the lightest and most compact wireless timing system on the market. Enclosed in a waterproof housing it’s suitable for use in almost any conditions. It has a fast deployment time (less than 1 minute) and can be used to setup live data feeds from remote checkpoints along a course with no special training required or cater for mass fast moving targets over a finish line. The Active Pod and is designed for simplicity, but powerful enough to target the most demanding applications. The Active Pod is positioned either directly above, or squarely on the side of the finish line. The reading area (depicted in orange below) is 20 degrees in both a horizontal and vertical direction out the front face of the Active Pod. The Active Transponder is configurable from 2ms to 50ms continuous transmission intervals. 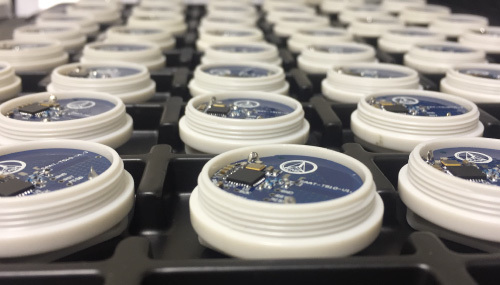 The Active Pod will detect these signal pings when the Active Tag enters its reading area. The Active Pod will log the first and last tag read of the Active Tag as it passes through the Active Pod’s reading area. Using the entry and exit time, an interpolated finish time is calculated. Although the Active Pod on its own will provide a high degree of accuracy in timing, we have included additional features available for the more serious timers that require precision timing. For those requiring a precision time, you have the option to include a separate trigger device (eg: start gate, photo-cell beam, or similar) by connecting these auxiliary devices directly to the Active Pod’s trigger input. This means a time will come from the “break” on the auxiliary trigger input and associate this time with the transponder read within a specified threshold. Standard Active Transponders from competing systems generally use two channels to both wake-up and read the transponder. This means cumbersome wire loops are required to be placed on a timing line in order to wake the transponders. Wire loops are not always practical to deploy in the field and require additional setup and tuning before operation. We have taken a different approach. The Mobii Active Transponder uses a smart proprietary communication protocol between Active Pod and Transponder to control the wake-up of transponders and read these as they pass through a timing. There is no need for mats or wire loops. The benefit of our approach to this solution is that Active Timing has now become cost effective. The same quality, but at a lower cost because of the technology approach to this simple problem. The Mobii Active System can wake and read tags in a controlled manner from 2 meters up to 100m range. Timing data is stored on the internal memory of the Active Pod itself. The Active Pod implements a priority level to communicate and deliver results. 1)	First, the Active Pod will scan over Wi-Fi and Ethernet to locate a software timing Host (the timing software). If it finds the host on this network, it will communicate and send tags in real time to the Host to calculate and display results. 2)	If a local network is not available (ie: Active Pod is deployed in the field as a remote timing point) then it will connect online using the internal cellular modem and send data to the Mobii Cloud Servers in real time. 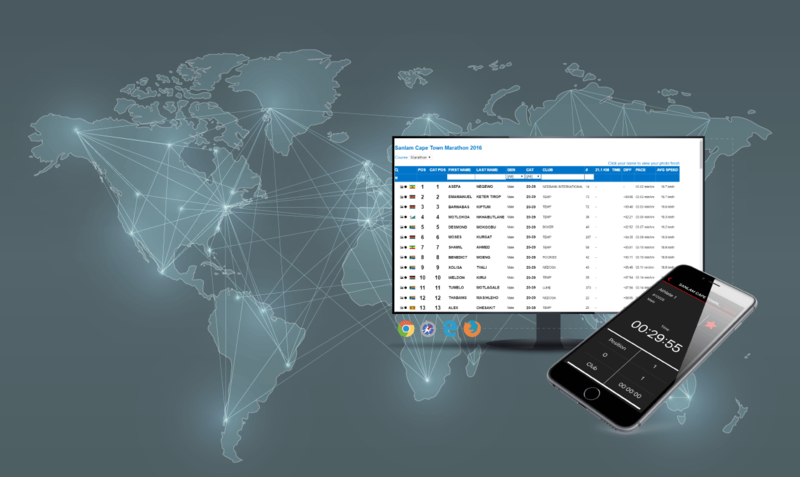 When the data is received by the Mobii Cloud Servers, results are calculated automatically and the transponder data is then synchronised with timing software used by the operator. 3)	If the Pod has no connection to a local host or the Mobii Cloud Servers, then the Pod will store the records internally and continuously attempt to re-send the data until a connection is established. The internal memory of the Active Pod can store up to 100 million transponder records on its internal rolling storage memory. Our advanced user interface is web based, for maximum compatibility across as many devices as possible. Our results are delivered via a web page, which is fully customizable and can even be embedded into the organiser's website. Results are available anywhere in the world, through the power of the cloud. 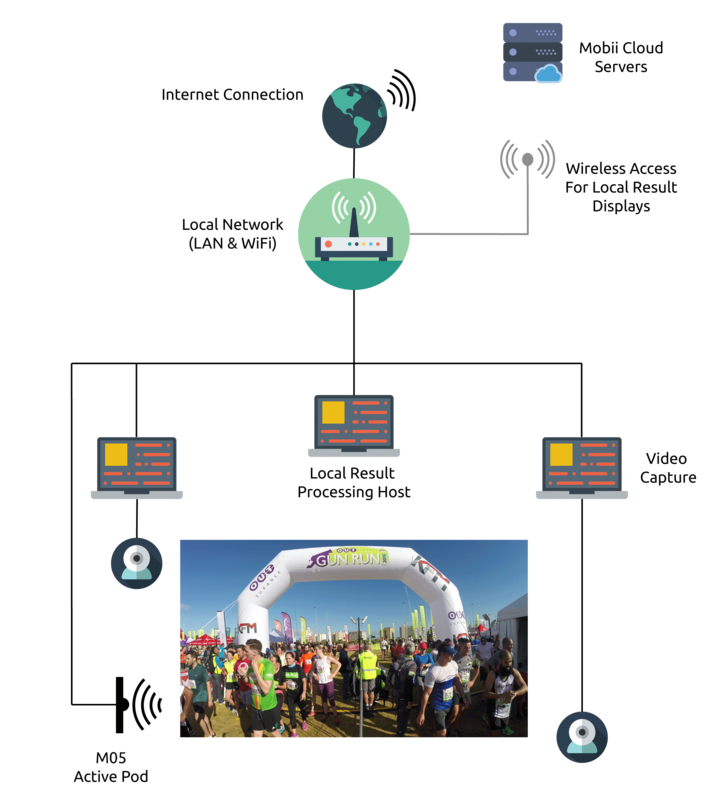 Races can be timed entirely by remote using just timing pods positioneed along the course. Results can be displayed to anyone with a internet connected web browser. Our timing devices have built-in GSM modules which allow for easy connection via a cellular network, wherever there is coverage. A built-in LiPo battery allows for 8+ hours of operation, making our devices ideal for use in check-point scenarios. When deployed remotely, pods connect to the Mobii Cloud to send and process Tag Reads. Results are calculated in real time and displayed on results displays globally, as the race unfolds. Monitor the progress of participants from the finish line with ease. in place, yo ucan harness the full potential of the mobii timing solution. 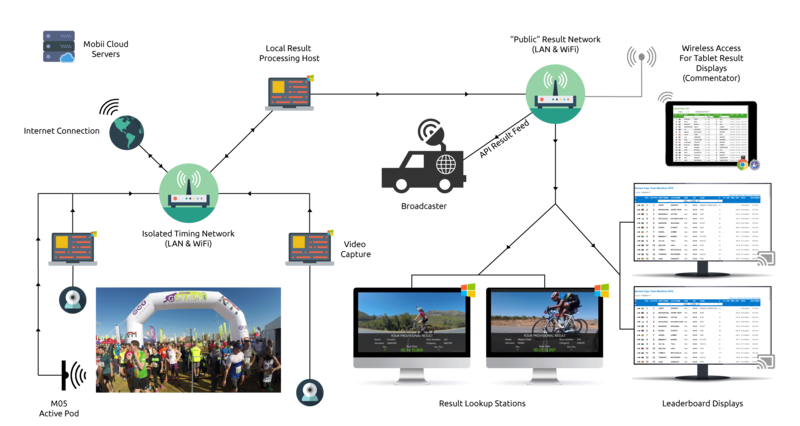 Multiple camera angles recording the finish line, Multiple timing devices caturing data. Include photo-finish result lookups in your offering to the organizers. Interface with live broadcasters with ease. All of it centrally connected and working together. All data is synchronized with our cloud servers, offering data safe-guards, as well as anywhere access. Receive real-time registration data from the other side of the venue. Queries can be dealt with away from the finish line leaving you to focus on what metters most.